Data-a word that we use so much in day to day lives, and yet never give it the credit it deserves.For instance, a single strand of DNA contains 1.5GB of data. Every single creature walking the face of the earth right now is nothing but a collection of data. That sounds mechanical but is quite true. Now imagine being able to harness the power data holds to make our lives better, easier and more systematic. This is exactly what Big data analytics aims to provide. The amount of digital data in the universe is growing at an exponential rate, and constantly changing and shaping how we live. With less than 0.5% of the world’s data currently being analysed, it’s time to tap into all existing resources to harness the potential. The power of data is not inherently in the data, but in the ability of an organisation to make sense of it. Theoretically, the data in the world doubles every year. Harnessing the insights is a technical task, and it requires individuals who can learn and relearn at the pace of the industry. The big data industry is an industry of the future since cloud and IoT shall increase the amount of data available, and so is the demand for the professionals to cater to these demands. IIT Kanpur is one of the very first institutions in the country to sense the currents and set sail. The MBA program offers analytics as specialisation and the graduates of this program learn to employ tools to support different functional areas of organisations belonging to various industry domains. Business Analytics are used in industries like financial services, retail, healthcare, manufacturing, energy, oil & gas, telecom, sports, etc. Having more information on hand is a panacea in the uncertain business world, and training students through real-life case studies instil a more logical thought process. 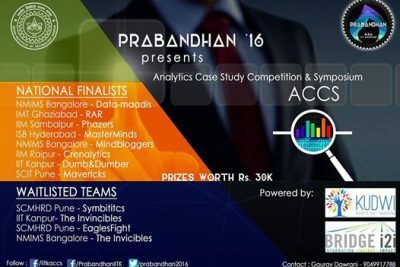 Analytics Case study competition and symposium(ACCS) is the flagship event of the annual Management fest of IIT Kanpur. It aims to familiarise B-school students in India with data analytics problem statements and challenges. Having a healthy competition is one of the best ways for peer-learning, and it is a widely acclaimed event of its kind in India. ACCS 2016 had 50+ campus ambassadors ,who worked as extended organising committee to help scourge the hidden talents in India and abroad. 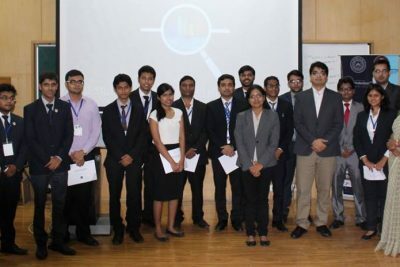 ACCS 2016 saw around 4000 registrations from 100+ institutions around the globe and handpicked 6 teams for the on-campus finale.These teams were called to campus to present the solutions of the problem statement given to them earlier on October 1, 2016. 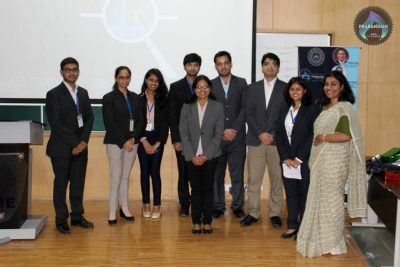 The judging panel had experts in their respective fields and after a lot of brainstorming,results were declared.Team RAR (IMT-Ghaziabad),Team dumb & Dumber(IIT Kanpur) and Team Phazers (IIM Sambalpur) ranked 1st, 2nd and 3rd respectively. The judging panel shared their own insights and congratulated Team ACCS for putting up such a wonderful show. MBA IITK is well known for having carved a niche in producing the finest tech-managers of the century, and it’s through battles like these that the ultimate glory is achieved.